KARATE for kids is the ideal activity for building self-confidence, balance, coordination, discipline, and courtesy while learning basic self-defence skills. Children may start training at Ishinryu Karate from as young as 3 years of age and as old 73. 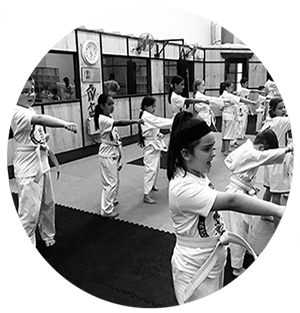 Our karate classes located around Frankston provide a warm, friendly and encouraging atmosphere and all teachers are fully accredited with the NCAS government accredited coaches and working with children accreditation. Children may train in regular classes (alongside people of all ages in our specialised family class). Classes run for thirty minutes to one hour and consist of basic training as well as many karate game sense drills. With most activities, the participant gains feedback on performance by either winning or losing against their competition. While competition brings out competitive spirit, it can hinder the development of self-confidence for those children who don’t win frequently. As karate is a non-competitive sport the only competitor is one’s self. Therefore, as a participant continues to improve each week, they only ever find themselves winning, which serves to bolster the child’s self-esteem. Karate offers a coloured belt system where all students Children, Mini Mites (3 years old) , Dragons(4-5 year olds), Ronins(6-12 year olds) – Seniors (Teens &Adults) all start at White belt and work up through different colours (Red , Yellow, Orange, Green, Blue, Brown, and Black belt). In our Mini Mites and Dragons have specialised ranking system with white belts with a stripe in colours mentioned – both Mini Mites and Dragons have achievement card which also measures their progress not only in Karate skills but life skills. Children are encouraged to set goals for these belts. Our goal is to help your child grow into a respectable and confident young individual. 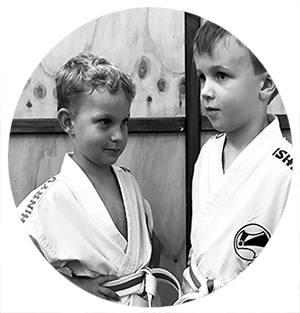 Almost all children behave in a disciplined and respectful manner inside the dojo, however, once they put their karate uniform away, some may forget to practice the things they have been taught at home or at school. This is where the teacher/parent connection can be a powerful tool. By regularly communicating with the teacher as to your child’s progress and behaviour at home or school, a teacher can better aim their message to your child. Our Mini Mites and Dragons program have parent dojo(school) involvement within the class again bringing that Sensei/teacher-parent connection. While the prime focus of karate is to develop character, students also learn basic self-defence skills. Ishinryu teachers regularly promote that children SHOULD NOT use their karate under any situations. Should any child use their karate (either at home or at school), we ask the parents to notify us of this so together we can speak with the child about their conduct. (We have many verbal karate ques to help both children and seniors with warding off a potential confrontation, here’s an example ‘ I see you’re upset, BUT, it was not my intention to upset you’ ). In the case of older children or teenagers being bullied at school we have a script that they say to their school teacher or principal, “ if (name) does not stop annoying me – I will not be responsible for my actions .“ Everybody in this world is responsible and accountable for their actions – we do not promote the use of karate in a physical sense – however this script is a way to avoid escalation of a problem in an intellectual manner by smart KARATE. We have designed a program for “mini mites” 3 years olds, with the aid of mum or dad, you will learn the same karate skills as your child. The first few years of their life come with a significant learning opportunity that shouldn’t go to waste. During this critical time in your child’s development, it is essential that they engage in age-appropriate activities promoting imagination, sensibility and healthy coordination between the right and left the brain. Parent-child bonding and stimulating kids’ activities at Ishinryu have proven helpful in maximising a child’s potential to grow up to be intelligent and well-rounded. Each lesson will be restricted to 10 children, and when joining each child will receive a karate uniform and “mini mites” program syllabus. 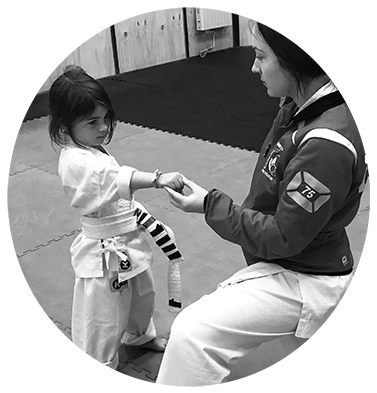 The program puts a value on achieving and perseverance when the student reaches four lessons they will receive a stripe on their belt for that activity. Introducing a specialised Karate Program designed for children aged 4 and 5 years old. Confidence, Discipline, Develops early socialising skills, Instills discipline and carry out basic instructions. Parents, we involve you in the development of your child by assisting in the session, your child will have learned basic Karate terminology as well as basic karate punches, kicks, blocks and moves while having lots of FUN. Mums and Dads may view the class with knowledge that their child is taking their first steps to independence. Children have the confidence to defend themselves using anti bullying skills. Our Ronins program promotes these areas, Fitness, Discipline, Dedication, Determination, Desire, Self-Confidence, Self Esteem, Self Development, Self-Defence & Leadership Program as another benifit Ronins all have the opportunity to compete at local, state, national & international Levels. Children enjoy the benefits of Karate, the secret is making learning FUN while producing exceptional results with children over time. Doing ordinary Karate skills extraordinary.